Injury, overuse or the aging process can cause shoulder issues that leave you in pain and unable to have your full range of motion. Swelling, pain, weakness, reduced mobility, tenderness or achiness can all be signs that you have a rotator cuff injury. 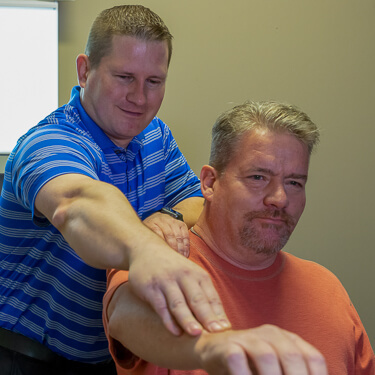 At Body Basics Chiropractic, our team is trained in returning the stability to your shoulder and all surrounding areas. Rotator cuff injuries are unique in that no two are necessarily alike. There can be muscle imbalances around the shoulder blades, biceps, pectorals, upper back or clavicle. You also may experience issues with the ligaments, tendons or soft tissues of the shoulder and you may have scar tissue that’s built up in the area. With methods such as massage and Graston Technique, we can stretch out the tight muscles and break down the fibrotic areas. We’ll strengthen the weakened muscles and balance both sides of the body, making sure reinjury doesn’t occur. Since the cause of a rotator cuff problem depends on your particular situation, we rely on several forms of testing to pinpoint the source. Our chiropractors use orthopedic testing and muscle testing and examine your range of motion to find the issue. With our variety of techniques, we’ll seek to relieve your pain as quickly as possible. We usually see progress within a few visits, recommending a total of 4-8 for you to heal. You’ll be given exercises you can do on your own at home afterward to ensure complete healing. Contact us today to learn more about rotator cuff syndrome Overland Park or to book your appointment!